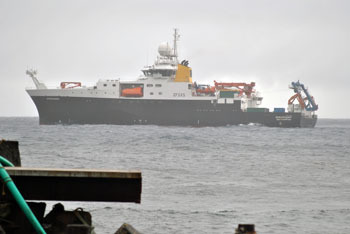 The vessel will be here for ten days or so carrying out research in Tristan's waters, primarily on the seamounts. 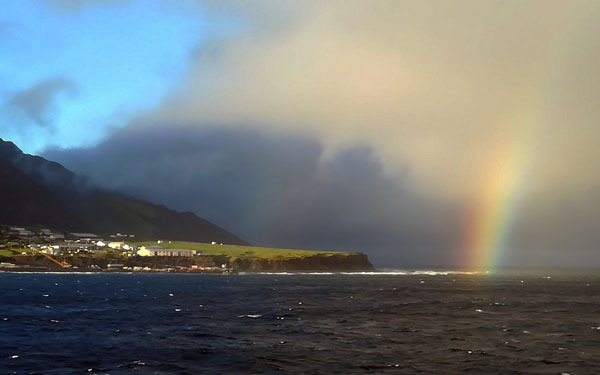 The expedition, which is a collaboration between the Blue Belt Programme and the British Antarctic Survey will focus on understanding the biodiversity and habitats associated with the seamounts in Tristan da Cunha, about which very little information is known. 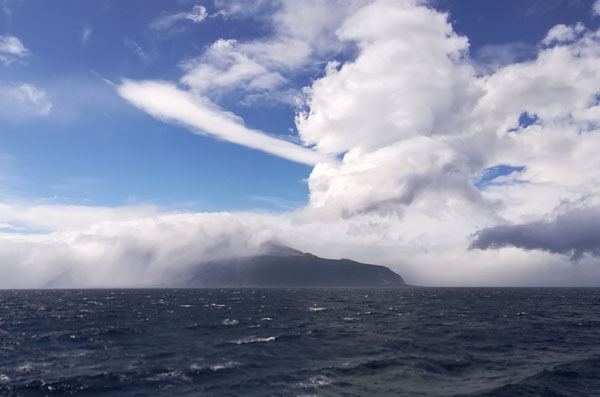 RRS Discovery arrived off Tristan on Thursday 21st March 2019, but sea conditions wouldn't permit a safe landing, so the ship continued its marine-based studies, travelling to Nightingale Island waters during the day. Is it a day? Yes it is! The UK research vessel RRS Discovery arrived properly (i.e. able to land) on Friday 22nd March 2019. 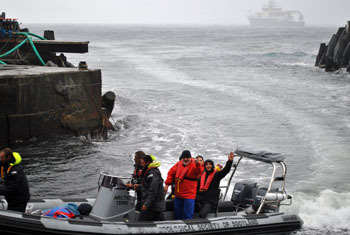 On arrival there was a swap of personnel for the multi-disciplinary team, completed by 10.00 GMT. 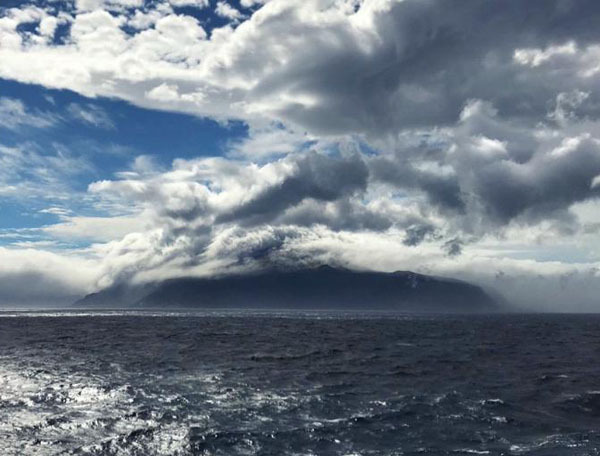 Joining the RRS Discovery voyage to the seamounts is a Tristan team comprising Warren Glass, Justin Green and Julian Repetto, who will play an active part in the research and analysis. RRS Discovery dropped off Oliver Yates from Cefas (Centre for Environment, Fisheries and Aquaculture Science), Katie McPherson from the MMO (Marine Management Organisation), Stephanie Martin, (Tristan Government's Environmental and Conservation Policy Officer) and seal scientist Marthan Bester. Katie and Oliver will be focusing on Tristan's work on our 2020 marine protection strategy; why we need one, what it might look like, what impact it might have on the community and economy and also how it fits in to the global strategy to protect the world's oceans. This is a real opportunity for Tristan to become a world leader in marine protection. We have said all along this must be driven by the needs and wishes of the Tristan community, and this is a great opportunity for everyone to engage with the team, so they can go away with a clear idea of what the community wants, and help formulate the strategy and actions needed to deliver this. There will be a series of talks and opportunities for everyone, including the school and prospective councillors, to engage. Please do so. Further details will follow once we know they are ashore. Stephanie will be working with Head of Tristan Conservation Trevor Glass and the team on conservation and environmental issues as well as working with Oliver and Katie. One of those coming ashore is an old friend of Tristan's, Marthan Bester. 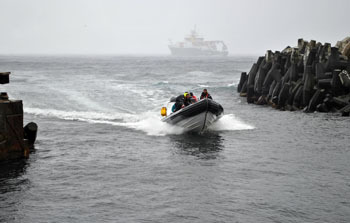 Marthan set off straight away with islanders George Swain and Matthew Green for The Caves to do more reserarch on Tristan's main Sub-Antarctic Fur Seal colony there. Welcome to you all! 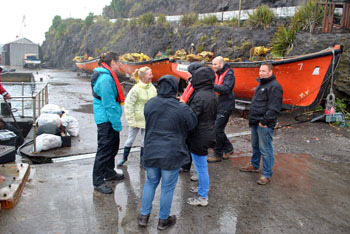 Pleased all now ashore / aboard and the vessel is on its way to the seamounts. See you back here in 10 days!